Except for a few afternoon clouds, mainly sunny. High 69F. Winds WNW at 10 to 20 mph.. Partly cloudy skies during the evening will give way to cloudy skies overnight. Low 47F. Winds NW at 5 to 10 mph. • A Carlisle resident’s bank car information was used to make fraudulent purchases totaling $615.91, on Jan. 12. All of the charges were made in the Atlanta, Georgia area, police said. • Julie L. Carney, 34, of Newville, was cited for leaving the scene of a crash on Roxbury Road, Upper Mifflin Township, at 10:41 a.m. Jan. 12. Police said Carney was driving a 1992 Pontiac Grand Prix east when she lost control, the vehicle spun, hit two trees and came to rest. Police said Carney then ran off, leaving the vehicle in the road. She was cited with not immediately notifying police of a crash, not driving at a safe speed and not driving on roadways laned for traffic. • A Mount Holly Springs woman’s Expedia account was hacked and the suspect attempted to purchase flight tickets from the Ukraine to New York City on Jan. 11. • A pair of skis was found on Coventry Drive, South Middleton Township, at 5 p.m. Jan. 12. • Derek J. Mulholland, 29, of Walnut Bottom, was charged with two felony counts of retail theft, misdemeanor defiant trespass and summary driving on a suspended license after an incident at Wal-Mart, 100 S. Conestoga Drive, Shippensburg, at 1:11 p.m. Dec. 26. Police said Mulholland attempted to remove various electronics from the store. He was arrested and charged. • A ring was stolen from a home in the 600 block of Shippensburg Road, Hopewell Township, between 8 p.m. Dec. 10 and 7:32 p.m. Jan. 2. • No injuries were reported in a rollover crash on Mill Road, Spring Township, at 7:30 a.m. Jan. 6. Police said Abraham L. Schmit, 18, of Lewisburg, was driving a 2009 Chevrolet Cobalt south when he lost control around a curve, the vehicle went off the road, hit an embankment, hit a tree, then rolled onto its driver’s side. Schmit was cited with summary not driving at a safe speed. 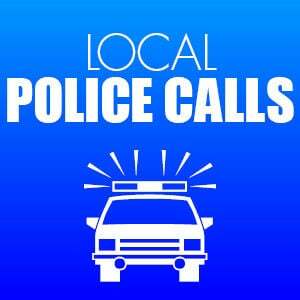 • Property was stolen from a home in the 100 block of West Main Street, New Bloomfield, on Jan. 12. Police said the suspect checked several homes in the area for unlocked sheds before entering into a garage and using a stolen wheel barrow to take several items from the garage and home. Police seek information. • No injuries were reported in a rollover crash on Valley Road, Rye Township, at 11:11 a.m. Jan. 12. Police said Richard E. Cowan II, 37, of Duncannon, was driving a 2004 Nissan Pathfinder east when he lost control on slush covered roads, the vehicle hit an embankment and overturned onto its roof. Cowan was cited with no driving on roadways laned for traffic. Information is from police reports and may be incomplete depending on the status of an investigation.